Another month, another update for Google Glass. The OTA started rolling out yesterday, offering a safe way to experience a nice set of improvements to the Glass experience. Still, advanced users need to flash updates for one reason or another, and they will be pleased to know that the XE8 system image is now available for download. The ZIP file is a healthy 348MB in size, which is roughly the same as last month's. 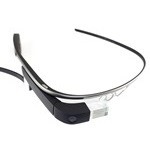 It's available alongside versions XE5 - XE7 on the Google Glass Developers page. The system image comes with the usual disclaimers. Users are welcome to flash it using the standard ADB interface, but doing so can void their warranties and potentially brick their devices. There's also the risk of losing access to future OTAs, even after flashing back to factory specifications. But if you're that type of person who both owns a pair of Google Glass and wants to root it, then you already know what to expect. Enjoy.